Dry, cracked heels can be embarrassing. Hard, callused skin on your feet is unattractive and if left alone, could even cause medical problems. Cracked skin is unsightly, and it can be painful if it starts to bleed. You’re also putting yourself at risk of infection. Thankfully, there are fantastic foot creams for dry, cracked feet that can get rid of the problem fast. It’s easy to ignore our feet until they look ugly or become uncomfortable. Hard skin that develops on your heels or the balls of your feet isn’t uncommon because there are so many possible reasons for it. Your day-to-day habits can affect the skin on your feet. You could be wearing the wrong shoes, or you could be putting your feet under too much pressure. We’ll cover the best over-the-counter foot creams you can use to fix the problem. If you don’t add moisture to your skin and reduce the chances of your heels cracking, you could be setting yourself up for more significant medical issues. 1 What’s the Best Foot Cream for Dry and Cracked Feet? 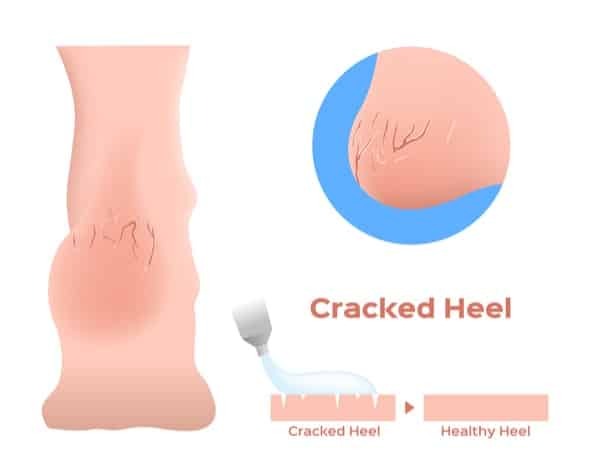 2 What Are the Dangers of Cracked Heels? 2.1 What is a Good Foot Cream for Diabetics? 4 Can Cracked Heels be Prevented? What’s the Best Foot Cream for Dry and Cracked Feet? You might think any type of lotion is good enough to moisturize your feet. That isn’t always the case. Some creams and lotions contain preservatives and parabens. For some people, that can make matters worse. Chemicals in certain lotions can dry out your skin even more. The best lotion for extremely dry feet should not only help your feet look better. It should relieve tired, aching feet and soothe your skin. One of the best ways to choose the right cream for extremely hard skin is to take a look at the ingredients. Lotions that contain ingredients like urea, shea butter, and jojoba oil are often the best for getting rid of cracked feet. These are deep moisturizing ingredients. They work be penetrating through even the toughest, hardest skin to hydrate it. Now that you know what to look for in a foot cream, let’s go over a few of the best on the market so you can make an informed decision. L’Occitane is known for producing professional-quality skincare products. The L'Occitane Shea Butter Foot Cream is no exception. This nourishing foot cream is specially designed for dry and cracked feet. It contains 15% shea butter to add necessary moisture to your skin, leaving your feet soft, smooth, and beautiful. Other soothing ingredients include arnica and lavender essential oils. This cream couldn’t be easier to use. Thanks to a formula filled with natural ingredients, it’s safe to use as often as needed. There are no parabens or sulfates included in the formula. You massage a small amount onto all areas of your feet. Use small circular motions when massaging it in for best results. Give extra attention to cracked heels, ankles, and your toes. It’s one of the best foot creams for dry toes. L’Occitane advertises this cream as a solution to dry, tired feet. But, it’s powerful enough to combat even the worst cracked heels and dry skin. One of the drawbacks to this product is that It’s a bit on the expensive side. But, a little goes a long way. You also won’t have to wait long to start seeing results if you use it regularly. With so many positive customer reviews, it’s clear that most people who use this on their feet think it’s worth every penny. Check the Price of L'Occitane Shea Butter Foot Cream on Amazon! CCS Swedish Foot Cream is a professional-grade cream that is used by podiatrists to help treat dry, worn feet. Not only does it repair dry, rough skin, but it can also help to prevent it from recurring with regular use. The unique thing about this foot cream is that it works with your body to help repair your skin and make it softer and smoother. It makes your skin’s natural defenses that much more effective, so when you continue to use it, you can prevent future foot issues from happening. The specialized formula is designed to keep your feet soft and supple. While the formula isn’t made of entirely natural ingredients, it’s safe to use as recommended. It is Lanolin-free and has been tested by dermatologists. To use correctly, start by massaging a small amount onto your feet and toes twice a day. Once your skin is repaired, you can use it as a daily moisturizing cream to prevent cracking and hardening. Using it consistently will help to keep your feet healthy and soft, even in harsh conditions. CCS Foot Care Cream is the winner of the Anti-Aging Beauty Bible’s best foot treatment. It works wonders as a product that professionals trust, as well as a part of your regular footcare/beauty routine. Check the Price of CCS Swedish Foot Cream on Amazon! Soap & Glory's Heel Genius Foot Cream does. It’s a Best Drugstore Beauty Awards winner, but this product does much more than make your feet look pretty. Heel Genius helps to soften rough feet in as little as one use. You can see the results overnight. It works on cracked heels, cuticles, and thick, calloused skin on the balls of the feet. Not only does it heal and repair, but once your feet are healthy, you can use it as a daily preventative foot cream. The deep moisturizing agent in Heel Genius is urea. Urea is a naturally-occurring substance on our skin. It keeps our skin hydrated and healthy. If there’s an absence or lack of urea in the skin, it becomes dry, flaky, and can crack. Adding that layer of protection back to the skin can make a big difference. So, the fact that it’s a key ingredient in this formula will help to moisturize the toughest of skin. On top of that, it will use your body’s natural moisturizing benefits to keep your skin stronger and protected. Check the Price of Soap & Glory's Heel Genius Foot Cream on Amazon! What Are the Dangers of Cracked Heels? If the skin on your feet becomes dry and hard and your heels start to crack, it might be embarrassing. But, that’s only a small problem when you consider the pain it could cause if not treated. If your feet get too dry, you could develop something called heel fissures. These occur when the heel of your foot wants to expand (because of pressure, etc.). But, if your skin is dry and not pliable, it’ll make it harder to expand. Trying to stretch out dry skin that isn’t pliable can make it crack. A crack in your skin is just like a cut, causing an opening in your body. Like a cut, a heel fissure can cause your skin to bleed. They are often quite deep into the skin because so many layers of thick skin have already built up. Because of this, bacteria and viruses can get into the opening. This can lead to infections and illnesses. If you do get an infection from a heel fissure, you’ll need to focus on treating that before treating your feet. It’s much easier to try to avoid this cracking, to begin with by moisturizing your feet with a quality lotion or foot cream. What is a Good Foot Cream for Diabetics? People with diabetes are prone to experiencing foot problems. It can be dangerous because blood flow to the feet can be restricted. This can potentially cause nerve damage, so it’s harder for someone with diabetes to realize there might be a problem. It’s important for people with diabetes to have a proper foot care routine. That includes checking their feet daily, and keeping them clean, dry, and moisturized. One of the best foot creams for diabetics is Eucerin Advanced Repair Foot Crème. This is a dermatologist-recommended brand that is fragrance, dye, and paraben-free. The Eucerin cream is designed to exfoliate and hydrate the skin of your feet. It also strengthens the natural moisture barrier of your skin, making your feet less prone to cracking in the future. If you have diabetes, your skin may be more sensitive. So, choosing a formula that is quickly absorbed and won’t leave a residue is always better. Eucerin’s formula does just that, and won’t leave your feet with a greasy, heavy feeling after use. To help ensure your feet stay healthy if you have diabetes, keep your skin moist. You should also drink a lot of fluid to improve that moisture from the inside out. Adding one of the best lotions for cracked heels to your routine can make a big difference in how your feet look and feel. Keep in mind that if you have diabetes, foot care is about more than just looking good. Is the skin on your feet really thick and hard? Do you have calluses and cracks? There are some things you can do to help whatever foot lotion you choose to work even faster and be more effective. An occlusive moisturizer is something that coats the top of your skin. It’s usually meant to be used with a moisturizer that absorbs directly into the skin, like the ones listed here. Once you’ve used an over-the-counter moisturizer that absorbs into the skin, apply an occlusive moisturizer. An excellent example of this is petroleum jelly or Vaseline. It will work by creating a thin film on the outer layer of your skin. This will help to lock in the other moisturizer and prevent it from evaporating. An occlusive moisturizer will also reduce water loss in your skin, keeping it naturally-hydrated as well. Many people apply their foot creams at night. This is a good idea, so the cream can absorb into your skin while you sleep. You can help it along by wearing 100% cotton socks to bed. Cotton socks will keep the moisture locked in while allowing your skin to breathe. You should notice the skin on your heels softens quickly after repeating this process for a few days. You can gently use a pumice stone on the thick, hard skin of the feet once it’s moisturized. The stone will lightly file away dead skin, allowing more layers to absorb the necessary hydration. Never be too rough with a pumice stone, and use it in gentle, circular motions for the best results. If your heels have cracked open, use a liquid bandage to fill them in. As stated above, these cracks can create big problems. If you’re using a moisturizer with chemicals, letting those chemicals get into a crack could cause stinging or burning. Provide a protective layer over the cracks in your heels before using a moisturizer, and you’ll create a strong barrier to reduce pain and your chances of infection. Extremely hot water can draw out moisture from your skin. A hot shower or bath can be comforting, but it could be causing more damage to your heels. Instead, take lukewarm baths and showers. You should also aim to take fewer showers altogether. It’s easy to think water hydrates your skin, but too much exposure can also dry it out. Limit your time to 5-10 minutes. If water gets trapped between your toes, it could cause a fungal infection, so It’s important they are dry. Once you’re out of the shower, apply a moisturizing cream right away. If you apply a foot cream right after you shower, it can be absorbed into the skin faster. Just like choosing the right foot cream can help your skin, selecting the wrong footcare products can cause damage. Harsh soaps and other skincare products can dry out the skin even more. Mild cleansers work best to keep your feet clean and healthy. If your shoes are causing hard skin to develop on your feet, it may be time to invest in a new pair! First, you should always make sure your shoes fit correctly. This will cut down on friction, which can cause hard skin to build up. If you have dried out heels, avoid wearing open-heeled shoes. Close-heeled shoes can give your heels time to repair, and they will keep moisture locked in. They will also provide your heels with more support so the skin won’t expand as much and risk cracking. Create more space in footwear with a professional shoe stretcher. Cotton socks are more beneficial than just keeping moisture locked in. They let your skin breathe and reduce friction. Too much rubbing inside your sock can cause your skin to become thick. Cotton socks prevent this, so your feet won’t dry out as easily. Avoid wearing socks made from wool or other synthetic materials. These can cause skin irritation and dry out your feet. We hope this guide has given you a few ideas on how to get rid of cracked heels. Experiencing dry, calloused feet can cause a lot of problems. For starters, it’s embarrassing. But it can also cause pain and discomfort, and even lead to bigger conditions like an infection. Choosing the best foot cream can help to prevent these problems. Now that you know the possible causes of your cracked heels, you can get started on making the right changes. Adopting a solid footcare routine is the best place to start. Of course, that footcare routine should include a great foot cream or lotion. If you follow the tips listed here and choose the right foot cream, you’ll see results in no time. Not only will your feet feel better, but you’ll be happy to show them off without embarrassment. Don’t wait until your feet start hurting or causing you more problems to take care of them. After all, they work hard for you each day. Adding a nourishing foot cream and practicing better skin habits can help you to avoid a world of discomfort. What Causes Calluses on the Feet?